Ever since I made the decision to move, my life has been crazy and hectic. As this will be my second move across the country in two years, I've started a list on how I'm preparing to move out of state. After I moved to Seattle from Florida, I swore I would never drive across the country again. Well, you know what they say about never say never. After 24 months in a new city, I'm moving back to the South and I couldn't be more excited! In an effort to be prepared, I've gotten a headstart on planning. I really don't want to leave everything to the last minute and am really making an effort to stay organized! All of my furnishings are courtesy of Ikea, Pier 1 and Craigslist. Because I chose to purposefully purchase inexpensive furnishings, I never had any plan to have these items long term. This includes furniture, lamps and other accessories. Because it costs more money to ship furniture than what my furniture is worth, I plan on selling my items and purchasing new (to me) furniture once I move. All of my furniture is in excellent shape. If I am unable to sell an item, I plan on donating it to my local Goodwill. I have a ridiculous walk in closet that is bursting with clothes, shoes and all sorts of accessories. I can honestly say I wear about 10% of everything in my closet. I have already started listing items on ebay. I plan on listing a handful of items each week on ebay until I move. This gives me plenty of time to get organized! I have a couple old cell phones, a Nook and all the cords that are tucked away in a box. Sadly, there isn't anything wrong with these items – I just felt the need for an upgrade. I also have a fairly new “all in one” printer, copier and fax machine that needs to go. I've been fortunate to live in apartment complexes that include an office with computer and print stations and all the fixings, so mine has been collecting dust for two years. It's in the way and needs to go! After a quick search on ebay and Craigslist, my items have a pretty good shot to sell as-is or for parts. One of the best ways I'm preparing to move out of state is by starting my research early. Having an Amazon Prime membership is really convenient. I plan on purchasing a new mattress and other household items through Amazon and having it arrive at my new address the day after I move in. I am going to be tired after the long drive and will not feel like running around to different shops to stock up on supplies. This will save me time and nothing beats free shipping. I also plan to use Ibotta, which is another free cell phone app. You use it after you go grocery shopping and use your receipt. It's basically a rebate app, so you can earn anywhere from 50 cents to $5 off everything you buy. I'll be adding nearly 2,500 miles to car over the course of three days, which means I need to make sure my car is in great shape. I recently took my car in for some major work and she is almost as good as new. Aside from this out of the ordinary maintenance, I am evaluating my tires, getting an oil change and making sure my car is near perfect. The last thing I want is a problem to occur while I'm on the road in unfamiliar territory. Having all my medication is essential. I plan on making sure all my refills are filled prior to moving. I also plan on researching what pharmacies are in my area prior to moving in case of an emergency. I'm a big fan of hotel reward loyalty points, so I'm planning on booking my hotel stays with a chain that I have points with. Since I'll be travelling with pets, I've been sure to look for only pet-friendly lodging. Plus, the earlier the hotel room is booked, the better the savings. I'm in the process of combining cash back sites like Ebates with different hotel chains to maximize my savings. Ebates literally pays you cash back when you make a purchase online and then deposits the cash back into your PayPal account. While I know I haven't covered everything when it comes to moving, I definitely have a good start. I promised myself that I wouldn't wait until the last minute to get organized this time around and am feeling more confident with the moving process. Whether you want to start an emergency fund or a vacation fund or a moving fund, you have to start setting some money aside. If you’re like most people and struggle with saving, you should consider using Digit. I’ve just started using this free program and love it. Digit lets you save money each week from your checking account. What I really like about Digit is that it analyzes my bank account and determines how much I can really save per week. Some weeks it might be $5 and other times it might be $20. You don’t have to worry about overdraft and can contribute less or more if you need to. As of now, I don’t know an easier way to save money! You can learn more about Digit here. 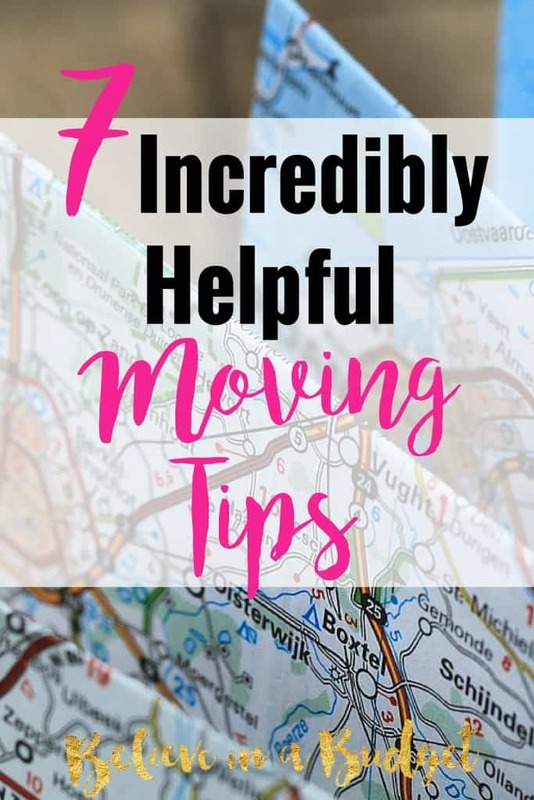 What other tips can you give me for preparing to move out of state? Nice post!! One great way to stay on budget is using sites like furnishr.com. I am moving to the US right now and they are helping me design my new home and they will deliver and set everything up for me. Its waaay cheaper than doing everything else on your own!